Best Training & Service provided! Give both theoretical and practical courses! Keep openning new classes for theoretical courses! Welcome to 3D VR Driving School! 3D VR is a certified driving school (École de conduite 3D VR) that provides systematic and standardized driving courses, including theory and practice, to students who want to obtain a driver’s licence for the operation of a passenger vehicle (class 5 licence), and to new drivers who need to improve their driving skills, as well. We adhere to “Quality & Reputation First!”, the code of conduct in our school. We strictly control the qualification of our monitors and instructors, strictly manage the training processes, ensure that the contents taught are standardized, correct and safe, the training processes are professional and efficient, and ensure that each student completes the driving training successfully at his/her pace in a pleasure environment, and gradually becomes a safe, cooperative and responsible driver with comprehensive driving knowledge, excellent driving skills, and confidence. We use various modern technologies in our training, just for one purpose: enrich your driving knowledge and improve your driving skills in efficient ways. 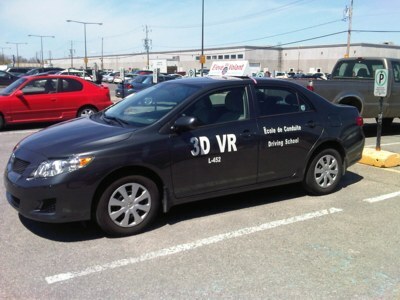 3D VR Driving School has two branches, one is close to Métro Côte-Vertu, another one is in downtown, close to Métro Guy-Concordia. We will convince you that 3D VR is a very responsible driving school, for the quality of our training and most important, for your future safety. We will cherish your love and do our best to serve you. You spend less and get more! The website is built and maintained by 3D VR Driving School. Copyright Reserved.